Steel gutters are available in a plain galvanized or enamel finishes and a wide variety of colors. 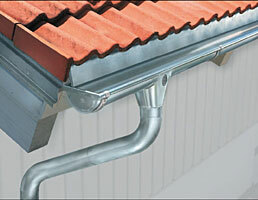 Steel gutters are prone to rusting and should be painted or factory coated, never left as bare metal. 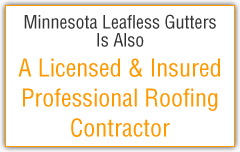 Steel gutters last on average about 15 years. Another gutter material option is stainless steel—this may not be the look you want and can be cost prohibitive, but lasts for years and years. At equivalent thicknesses galvanized steel is stronger than aluminum and contracts one-half as much. Steel is a good choice for gutter in northern states with snow and ice conditions as steel gutters can bear a much heavier load than aluminum. Even galvanized steel will rust over time. It is best to avoid field painted galvanized finishes. Often the metal is not cleaned or primed properly—when this happens it will result in poor paint adhesion and eventual pealing and flaking of paint. Hot-dipped galvanized finishes are preferred over other galvanized finishes. Steel gutters, downspouts, and gutter covers may be the right choice for your application and budget. To find out, call us today!